For over a decade, Atanes has tried numerous times to mount a production based on Crowley, the legendary cult figure and mystic. His latest attempt — begun in 2007 — followed Crowley on a mystical trip through the Egyptian underworld where he battles the demon Choronzon and encounters several significant people from his real life, such as Hanni Jaegger, Fernando Pessoa, Leila Wadell, Victor Neuburg and Raoul Loveday. 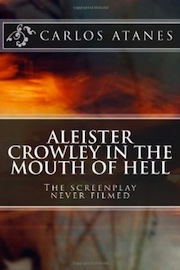 That project, instead of a completed film, is presented as the unproduced screenplay Aleister Crowley in the Mouth of Hell and is now available on Amazon. Crowley continues to be a subject of great interest to underground filmmakers, being a source of inspiration to classic filmmakers like Kenneth Anger and Harry Smith; figuring as a major character in Craig Baldwin‘s epic collage narrative Mock Up on Mu; and as a subject in various documentaries and short films that you can read about here on the Underground Film Journal. Buy Aleister Crowley in the Mouth of Hell on Amazon!